Skywatchers will get a glimpse of some truly amazing night sky events in 2014, from an asteroid zooming past one of the night sky’s brightest stars to amazing full moons and Martian meteor showers. Editor’s Note: If you snap an amazing night-sky photo and would like to share it with SPACE.com for a possible story or gallery, please send images and comments (including your name and the photo’s location) to managing editor Tariq Malik at: spacephotos@space.com. An exceedingly rare celestial event is predicted for early this morning when an asteroid will briefly hide one of the brightest stars in the sky from view. The asteroid in question is 163 Erigone, and the star that it will obscure is Regulus, in the constellation of Leo, the Lion. Mars will come to within 57.4 million miles (92.4 million km) of our planet, making its closest approach to Earth since January 2008. All through the night, Mars will resemble a dazzling star shining with a steady fiery-colored tint; its brightness will match Sirius, the most luminous of all the stars. As a bonus, later that very same night (actually the early hours of April 15), North America will have a ringside seat to a total lunar eclipse when the full moon becomes transformed into a mottled reddish ball for 78 minutes as it is completely immersed in the shadow of the Earth. This total lunar eclipse will be the first one widely visible from North America in nearly 3.5 years. April 28-29: A “Ring of Fire” Eclipse that Nobody Will See? It is quite possible that only penguins will witness the annular (ring) phase of this eclipse, as it will occur within the uninhabited region of Wilkes Land in Antarctica. A partial solar eclipse will be visible from Australia. Perhaps the most dramatic sky event in 2014 could come at the start of Memorial Day weekend. 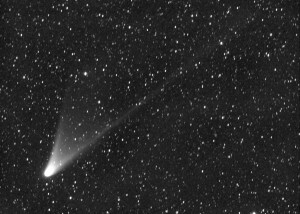 In the predawn hours of Saturday, May 24, our planet is expected to sweep through a great number of dusty trails left behind in space by a small comet (known as P/209 LINEAR). On Aug. 10, the moon turns full at 2:09 p.m. EDT, and just nine minutes earlier it will arrive at its closest point to the Earth in 2014 at a distance of 221,765 miles (356,896 km), making this a so-called “supermoon.” Expect a large range in ocean tides (exceptionally low to exceptionally high) for the next few days. See the strange full moon names of 2014. This one is more of a lowlight than a highlight, unfortunately. The annual summer performance of the brilliant Perseid meteor shower will be severely hindered by the light of a nearly full moon. An hour before sunrise, low in the east-northeast sky, the two brightest planets, Venus and Jupiter, will be strikingly close together. The two worlds will be separated by less than two-thirds of the apparent width of the moon in our sky, making for a very eye-catching sight. Oct. 8: Another Total Lunar Eclipse! All eyes will be on the Red Planet in October as Comet C/2013 A1(Siding Spring), discovered by Robert H. McNaught at Australia’s Siding Spring Observatory, will pass extremely close to Mars. The comet will come so close, in fact, that its coma may envelop Mars, as well as create a stupendous shower of meteors as seen from the Martian surface. The moon’s penumbral shadow will fall over much of North America as well as extreme eastern Siberia, producing a partial solar eclipse. Greatest eclipse, with more than four-fifths of the sun’s diameter covered by the moon, will occur in M’Clintock Channel, an arm of the Arctic Ocean which divides Victoria Island from Prince of Wales Island in the Territory of Nunavut, Canada. This is another lowlight. The Geminids, regarded by many observers as the best of the annual meteor showers, has the misfortune of occurring during the time of a last-quarter moon, which will pretty much squelch all but the brightest meteors.